Funded by a grant from the university's Sustainability Fund, the Brandeis Rooftop Community Farm club is a student-run organization that came about after students in Professor Laura Goldin's “Greening the Ivory Tower” experiential-learning course were inspired to continue their studies on urban sustainability. The 1,500 square foot farm is constructed out of milk crates atop the Shapiro Science Center’s Leo Gerstenzang Science Library. Green City Growers installed the system after building's structurals were assessed by Brandeis engineering students. GCG farmers also provide weekly maintenance and educational programming to help train the volunteers. 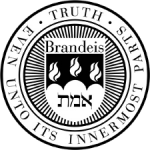 The Brandeis Farmer's Club has set up a Community-Supported Agriculture program for faculty and staff members, who will receive some produce in exchange for buying into the program for a half or whole share, or donating their time to the farm's upkeep. A larger portion of the produce is either donated to local food banks or sold at the farmers' market to fund future investment in the farm.